Earlier today (or yesterday, depending on your sleep schedule), E-Hobby teased their upcoming Optimus Primal exclusive made from Titans Returns molds. 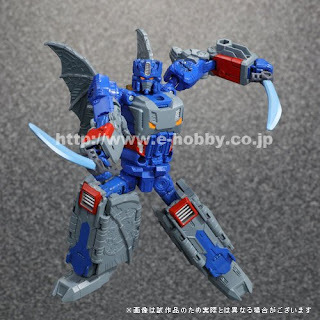 It's a wonderful homage to the original bat Primal toy that was released in the introductory two pack with him and a Alligator Megatron. That two pack has always held a special place in my fan heart. I just loved the toys and was always a little sad that they never really got a chance to shine. The original story pitch for Beast Wars was a continuation of the original crew past G2, and the pack in comic was all that existed of that premise. Shortly after, the story went in a 'Next Generation' direction. Which ultimately was the better idea, but I always held onto that original idea and wondered how it would have been. I've been a fast fan of the Titans Returns toys already. Not just as a Transformers toy line (I kinda like them), but on their own as well. Just a fantastic toy line that merges various toy things I dig and the fictional basis just keeps adding to my happiness. I had made the comment on my podcast that this might be my favorite line since beast era, and while it may be super early to think that way. I can't help it, I'm just so swept up in that certain joy you get as a fan when something is hitting every note just right. Man, I hope they do the Alligator Megatron too. Even if they don't do the Gator Megs, there's the Skullcruncher body that opens up all sorts of ideas. Gods, I love this line.